Bean soups come from a mixed heritage, you either love them or hate them, shun them or actively seek them out. Sometimes the despair is deserved if the soup is bland, or worse, a flavor that might be better suited as a salad. If you’ve grown despondent of ever trying another bean soup again in your lifetime, consider a one-meal moratorium on your bean-banishing and give this soup a taste test. We’re pretty sure you’ll change or your tune, at least about this soup in particular. Black bean soup has a flavor that is more like chili, thanks to the sofrito added after we purée a good portion of the soup. Sofrito is just a sautéed mixture of onions, spices, herbs and tomatoes, their flavors brightened with a bit of red wine vinegar. This mixture also adds just the right touch of texture, not enough to make this soup feel chunky, but enough that it isn’t a smooth purée any longer. But what sends this soup over the moon is the pork skewers we serve with it. Kielbasa and pork tenderloin, seasoned with a bit of spice rub and grilled until medium rare, give this soup the meat it needs, both literally and figuratively. If you like the presentation pictured above, you’ll need to keep track of your skewers. We soaked the skewers for about 15 minutes before threading on the meat, and then we turned the burner off completely under the empty end. We kept the grill at a more moderate temperature for these tender cuts of meat, between 375°F and 425°F. And we grilled it for only about 8 minutes total. If you are using charcoal, or cannot turn off the burn under the empty skewer end, you can wrap the wooden skewers in aluminum foil to keep them from burning. It’s a bit more tedious, but still does the trick. We also used fresh uncooked kielbasa in our skewers. A short spa treatment in some boiling water cooked the sausage without imparting any flavor that smoked kielbasa has. We’ll be adding plenty of flavor with the spice rub. Whichever kielbasa you choose, your tenderloin and kielbasa pieces should be cut to roughly the same dimensions for even cooking on the grill. For “Meatless Monday” this soup makes perfect sense. The bold flavors of the soup alone are guaranteed to please your crowd. The skewers can be prepared for the stalwart holdouts who insist on a bite or two of meat with their meals. You can even go completely vegetarian and replace the chicken broth with vegetable broth. Add a touch of fresh flavor with a ladle of pico de gallo for garnish. It’s time to give beans a second chance in your cold-weather repertoire. Add the beans, broth and bay leaves to a large dutch oven. Simmer over medium heat for 20-30 minutes. Remove the bay leaves and discard. Remove about a cup of the beans and set aside. Puree the remaining soup either in a blender or with an immersion blender until smooth. Return the puree and whole beans to the pot and stir to combine. Keep over very low heat to keep warm. Mash the sofrito slightly with a potato masher before adding it to the bean soup mixture. Soak the skewers for several minutes. Thread pork tenderloin and kielbasa onto skewers, alternating tenderloin and kielbasa. Sprinkle both sides of meat with spice rub. Grill over medium heat for 4 minutes a side. 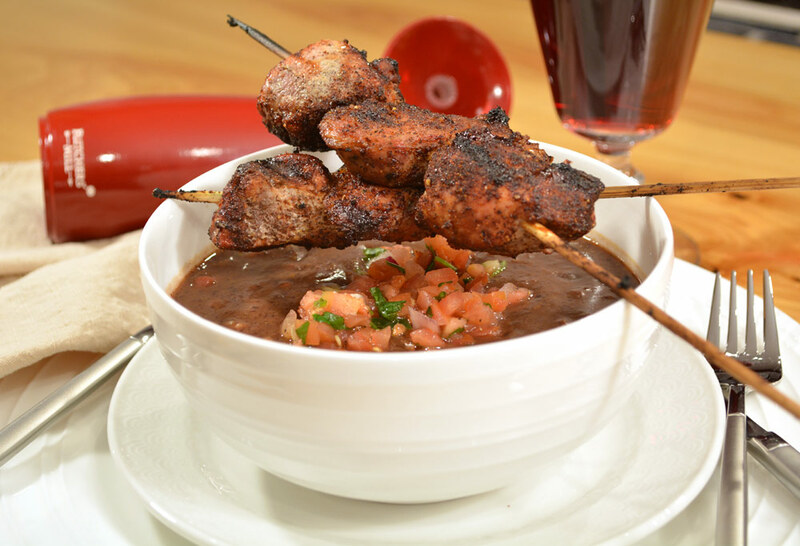 Serve immediately with hot soup and pico de gallo.